Improves Diet—For people who would like to take control of their eating, almond is a good option. This is filled with vitamins and minerals like magnesium, potassium, zinc and iron. Because of its high fiber content, you will also feel full and it would be easier to fight your cravings. Improves heart health — Thanks to the monounsaturated fats, protein, and potassium contained in almonds, the nut is indeed a heart-friendly option. This component effectively reduces the amount of cholesterol in the body and aids in prevention of heart diseases. In addition, almonds help to reduce the amount of C-reactive protein, which causes artery-damaging inflammation. There are actually nine studies which show that almonds have a positive impact on heart health and cholesterol. 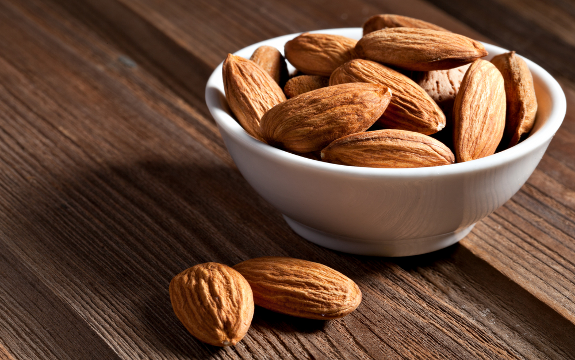 Regulates blood sugar — Even for diabetics, snacking on almonds can be beneficial. Further adding to the health benefits of almonds, research published in the journal Metabolism, showed that consuming an ounce of almonds before indulging in a high-starch meal resulted in 30 percent less post-meal glucose levels for individuals suffering from type 2 diabetes. This is compared to a 7 percent reduction for non-diabetics. Additionally, a study published in the journal Obesity also found that eating nuts twice a week or more was associated with a reduced risk of weight gain. Almonds are more than just your ordinary snack. The health benefits of almonds make it easy for you to effortlessly maintain good health with a tasty snack. While some foods such as almonds can be attributed to improved health, the FDA sometimes deems healthful foods like walnuts “drugs”.